I wrote an early draft of this blog post in March, when I was coaching someone who was leaving their job. I didn’t realize that eight months later, I would go through this process myself. And, what a process! Leaving a job is an art, and it’s hard to do well. I’ve added some thoughts about my transition below in italics. Getting buy-in is often associated with starting a new job -- getting to know everyone and their responsibilities so that you can build strong relationships and gain a better understanding of the organization. "Bye-in” is also a great way to leave a job. 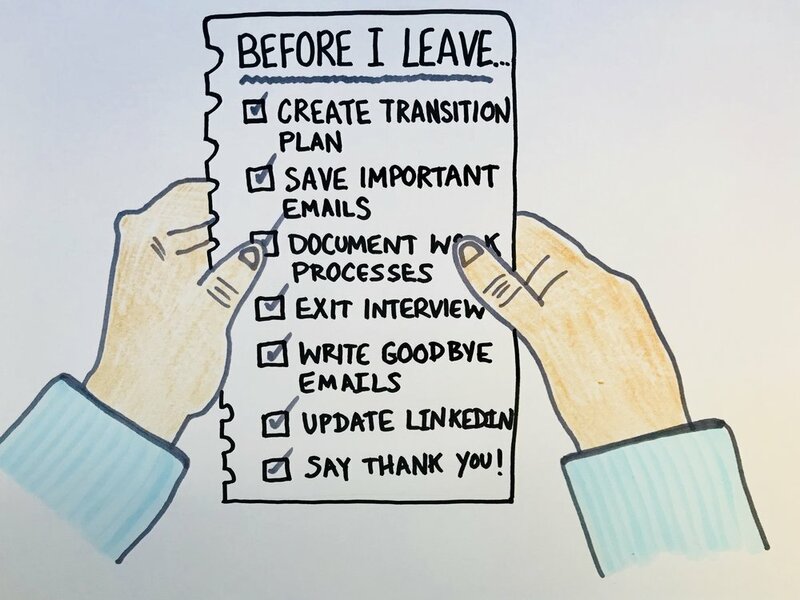 By having individual conversations with members of your team and other colleagues, collaborators and consultants when you’re planning to leave, they feel part of your decision and appreciate that you reached out to them. I made it a priority to sit individually with my teammates and give them an update on my plans. I also tried to be as strategic as possible about calling key contacts on the phone to share the news, although I’m sure I missed a few folks. Feeling a sense of control over your schedule goes a long way. Take the time to document your current responsibilities, both formal and informal. Use this list to get organized so that YOU have a clear idea of how your work breaks down and spend some time thinking about how you might distribute responsibilities. If there’s a new hire taking your position, this is a great way to share what you've learned with your successor. It might even influence the organization to re-purpose the position to better meet the organization's needs. Create a transition plan that includes what tasks you’re transitioning to whom, with dates when possible, and work to incorporate your plan into “bye in" conversations. I created a massive “to do” list of everything I needed to think about, such as documenting best practices, crafting unique messages for different customer segments I work with, cleaning and organizing my files, and reviewing HR policies that I needed to look into. The process of transitioning took more time than I expected, especially as I tried to balance communication and preparation for my new job. I often tell coaching clients that if you leave and don’t offer a set of key messages about why you’re leaving, or what your next step is, other people will fill in the blanks for you. Manage your own message and take the time to strategically think about what you want to share (my recommendation: stay positive). This is an opportunity to be clear about your future professional path and share your vision with others. I experienced a range of emotions as I wrapped up my work. And I did my best to continuously message where I was in the process of my job search and to keep others informed about impacts my work would have on them. This meant having a number of strategic meetings with colleagues! With all goodbyes, it can be difficult to move on. I remember when I left middle school, I signed my name in permanent marker on the inside of my locker, so as to mark my territory and honor my experience (I guess I wanted to make a mark?). I’ve seen events being thrown to honor someone leaving - cupcakes, anyone? Figure out what you need to do to honor your job and those who are leaving around you - maybe it’s saying goodbye to everyone at once, or maybe it’s more personal, like giving a small gift or letter to colleagues who have inspired you. I decided that, even as I was leaving, I was going to hold a lunch and learn on job search and lessons learned from the career leadership program I spent most of the year developing. This was a way for me to “pay it forward” and leave on a positive note. Take the time to write a thoughtful goodbye email that shares a few thoughts about your work experience, where you’re headed (if that’s worth sharing), what you’ve learned during your time at the organization and your new contact information. Be as creative as you want and be personal when possible. This isn’t original, and I know that everyone has their own way of saying goodbye. For me, it was important to convey what I had learned from the organization and honor my time by sharing a poem. After you leave, your work relationships will live on in different ways: at the least, as LinkedIn connections and references. And possibly as friends, social media comrades, vendors, consultants and collaborators. You’ve invested time in work relationships and you’ll want to think about how to continue to stay connected as you continually grow and expand your tribe. I hope that the relationships I’ve developed will continue on, and I am grateful that I was able to meet so many people in this job! If you’ve been in an active job search, and have a new job lined up, don’t forget to say thank you to everyone who helped you. Sometimes, when you’re so focused on ramping down your workload, you can overlook people who helped you get to where you are. Make sure to review the list of folks who have helped you, especially if they connected you to your new job! I managed my job search in Airtable, a useful database where I was able to list out key people, job titles and organizations. After I accepted my next position, I spent time reviewing people who had helped me and sent updates to my network about my job search. A big thank you to everyone who helped me!